Ah, life’s simple pleasures: a grand meal, a blissful night’s sleep, the joy of breathing deeply. Each is taken for granted, until something goes wrong. When it does, every banquet, bedtime and breath can become a source of torment. Thankfully, most of life’s nagging little pains can be eased or cured, with the help of medical professionals. Food plays a central role in our lives and brings us day-to-day pleasure. But when acid reflux or ulcers develop, it may become an object of fear. Dr. Chad Spangler, a gastroenterologist at Advocate Good Shepherd Hospital, Barrington, frequently diagnoses patients suffering from acid reflux, a condition that 10 to 20 percent of Americans experience at some point in their lives. Less-typical symptoms of acid reflux include coughing, hoarse voice, the feeling of a lump or knot at the back of the throat, nausea and pain while swallowing. “We can diagnose acid reflux just on the patient’s history alone,” Spangler says. “The most cost-effective treatment is to put the patient with typical reflux symptoms on a two-week course of an acid-blocking medication and then monitor for response. But for those patients with either atypical or high-risk symptoms, such as pain with swallowing, we would proceed to an upper endoscopy first.” He adds that acid reflux also may be triggered by hormonal changes women experience during pregnancy, but it usually disappears after delivery. Patients may ease symptoms of this condition by losing weight, elevating the heads of their beds by 6 to 10 inches and chewing gum. The latter stimulates the production of saliva, which coats the lining of the throat and helps to heal acid damage. Avoiding certain triggers, such as caffeine, chocolate, peppermint, fatty foods and smoking, may help, too. Ulcers, on the other hand, are an entirely different problem. Patients may experience sharp pains in the stomach which radiate into the back. After ensuring that the pains aren’t heart-related, doctors evaluate patients for factors that commonly lead to ulcers, such as use of non-steroidal medications like ibuprofen, and a strain of bacteria called Helicobacter pylori. A history of gastrointestinal bleeding may point to ulcers, as well. Treatment depends upon the physical characteristics of the ulcer. If it’s bleeding, immediate treatment involves an epinephrine injection to slow the bleeding. Ulcers may be cauterized with a small probe that’s passed through the endoscope, or may be clamped at the base. Doctors may prescribe antibiotics to address bacterial causes, and/or proton-pump inhibitors, a potent group of drugs that reduce gastric acid production. Surgery was once a common treatment for ulcers, but invasive surgery is only used today in extreme circumstances, when endoscopic therapy isn’t possible. For many people, a good night’s sleep is an elusive dream, no matter how many sheep they count at bedtime. Along with leaving people tired and cranky the following day, ongoing sleep deprivation robs them of the rest they need to enjoy optimal physical and mental health. While scientists are still trying to learn exactly why we need sleep, it appears to be necessary for our nervous systems to work properly, according to The National Institute of Neurological Disorders and Stroke (NINDS). Some studies suggest that sleep deprivation adversely affects the immune system, as well. While most people experience a bad night of sleep now and then, those with chronic sleep problems may benefit from the help of a specialist like Dr. Firas Dairi. Through Centegra Health System’s Sleep Services Department, Dairi helps primary physicians to diagnose and treat sleep disorders. The Sleep Services staff works directly with board certified doctors to help patients age 5 and older. Apnea occurs when patients stop breathing for varying lengths of time during sleep, then gasp for air. The condition is associated with elevated blood pressure, heart rhythm abnormalities and other health problems. When sleep specialists suspect apnea, they order a sleep study. 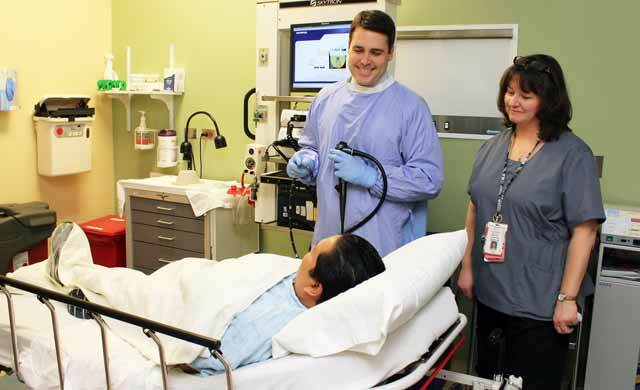 Patients undergo an overnight test during which their breathing, oxygen level, heart rate, brain waves, and eye and extremity movements are monitored. Results are reviewed and a diagnosis is determined. 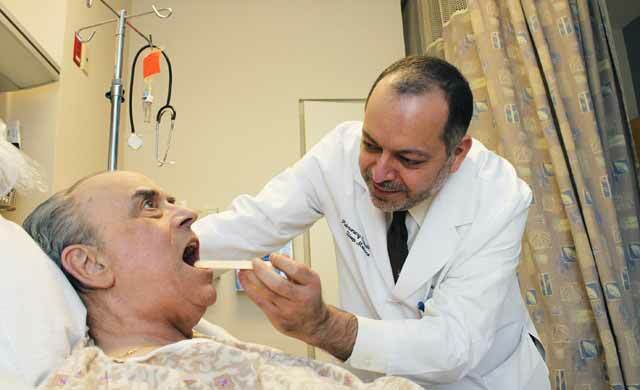 Dr. Firas Dairi, a sleep disorder specialist with Centegra Health System, prepares George Weber for an overnight sleep study. The results are used to determine causes of sleep problems, such as apnea. Oral appliances may be useful in controlling mild to moderate cases of apnea. Dairi recommends that patients see a sleep-certified dentist to obtain a prescription appliance, which should then be proven effective in a sleep lab. Even with CPAP treatment, some patients continue to experience daytime fatigue, says Dairi. There are other ways to help them overcome this condition, including close follow-up and prescription stimulants. Another kind of sleep dysfunction is insomnia. There are many potential underlying causes for insomnia. Because of this, a team approach is used to uncover them. Underlying causes may include depression, bereavement, anxiety, neurological conditions, psychological issues and medications. Drug and alcohol abuse, bad health habits, poor sleep hygiene and chronic pain have been known to complicate the diagnosis process, notes Dairi. Many diseases may contribute to a patient’s insomnia, such as Parkinson’s and Alzheimer’s. Childhood insomnia may be the result of poor sleep habits, or a trained response to parental discipline. In some cases, the patient may need to see a psychiatrist, in addition to a primary doctor and sleep specialists, to determine the best course of treatment. When insomnia occurs over a period of three weeks or less, the condition is considered acute; longer-lasting insomnia is chronic. While finding and treating an underlying cause may require patience, the relief it affords is well worth it. Fewer sheep and more sleep add up to better overall health. If you suspect that your pain and suffering is all in your head, you may be right – especially if you’re among the 35 million Americans suffering from sinusitis. Sinuses are the empty spaces in our skulls that make our heads lighter weight and easier to move. Mucous membrane sinus linings protect our interiors from foreign invaders like dust, pollen and germs. They’re lined with tiny hair-like structures called “cilia” that wave back and forth, moving irritants to the back of the throat, where they move down to the stomach and are destroyed by stomach acids. By definition, sinusitis is simply the inflammation of that sinus lining, regardless of the cause. Symptoms include nasal obstruction, post-nasal drip, loss of the sense of smell, and pressure around the eyes, forehead and nose. In severe cases, patients may experience facial pain. Other symptoms include malaise, low-grade fever, halitosis (bad breath), toothaches, cough or earaches. Most often, the initial cause is simply a cold or the flu, viral conditions that can’t be treated with antibiotics. Sometimes, allergies, polyps or other irritants cause the lining to swell. 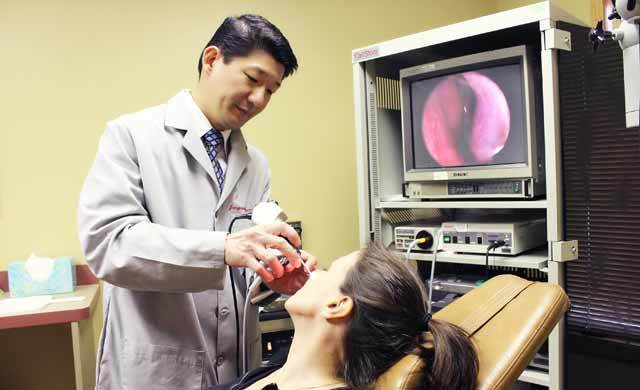 But once sinus pathways become blocked for any reason, sinus cavities become a friendly place for infectious bacteria to breed, explains Dr. Jongwook Ham, an otolaryngologist with Associates in ENT, who treats patients in his Elgin office and at Provena Saint Joseph Hospital in Elgin. “The goal in the treatment of sinusitis is to reduce the inflammation inside the sinonasal passages and keep drainage pathways patent [open] as best as possible,” says Ham. Cold and flu symptoms caused by viruses typically start to improve by Day 5, says Ham. If they worsen or persist beyond 10 days, a diagnosis of bacterial sinusitis is likely, and patients should visit their family doctors, who may prescribe antibiotics. But in cases when routine treatments fail, patients can seek the help of ear, nose and throat specialists like Ham. If cultures are negative, but symptoms persist, the patient may be tested for allergies, a common contributor to sinusitis. Allergies result when a person’s immune system responds abnormally to otherwise harmless substances, such as pollen. Allergies cause inflammation that leads to symptoms resembling a sinus infection. Medications prescribed in the treatment of sinusitis may include nasal steroid sprays, which work by reducing the inflammation inside the paranasal sinus passages, to keep drainage pathways open. Doctors categorize sinusitis according to its duration. “Acute refers to sinusitis that lasts up to four weeks, but is more accurately defined as lasting more than 10 days,” he says. “Chronic sinusitis lasts 12 weeks or longer, and sub-acute sinusitis falls in between these time frames.” Recurrent sinusitis is diagnosed when the acute form occurs more than three times per year. Sinus irrigation, or a neti pot rinse, is another treatment for sinusitis. Sinus irrigation involves using a solution of pH-balanced saline to flush out and loosen irritants from the nose. Washing away mucous, pus, allergens and bacteria may help to keep the sinus pathways open. If a condition remains unresolved, a doctor may order a CT scan, which may reveal structural blockages in the sinuses. Polyps or inflamed and swollen tissue may cause problems of their own, by obstructing the sinus drainage pathways. Obstruction then results in further inflammation that causes blockage, and a vicious cycle persists. This entry was posted on Monday, March 19th, 2012 at 12:00 pm	and is filed under Health & Fitness, Top Posts. You can follow any responses to this entry through the RSS 2.0 feed. Both comments and pings are currently closed.